Have you ever heard of Hobby Horses? No, not the kind with the springs, the horsehead on a broomstick kind. Now, replace the horsehead with a pig head... welcome to Hobby Pig. 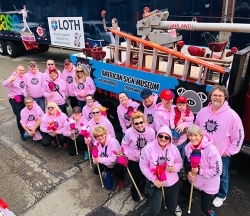 Cincinnati, OH, April 08, 2019 --(PR.com)-- On Friday, May 3, 2019, the American Sign Museum will host its first ever fundraiser using the Kentucky Derby as inspiration. Teams of four will compete for trophies including Most Creative Costumes, Fastest Time, Best Team Name, and Most Authentic Pig Squeal. One lucky member of each winning team will compete in the final race to determine the winner for a year’s worth of bacon. The 2019 guest judges include Eric Avner, People’s Liberty and Julie Niesen, wine me, dine me. Inventive costumes is a must for everyone. Light bites are included in the price. A cash bar will be provided. Woodford Copper Mint Julep cups for the first 100 attendees. Video Horse racing. The party continues afterwards at Second Place, the official after party bar for Hobby Pig. Get ready to race, watch and laugh. Tickets and additional information are available online now at www.americansignmuseum.org or by calling 513-541-6366. All proceeds to benefit the American Sign Museum. Signage reflects the history, technology, commerce and culture of our communities. To tell the stories of signs and the sign industry, Tod Swormstedt, former editor and publisher of Signs of the Times magazine, founded the museum in 1999 as his self-proclaimed mid-life crisis project. With a mission to educate the community about the history of the sign industry and its significant contribution to commerce and the American landscape, the museum was organized to preserve, archive and display a historical collection of signs in their many types and forms. The American Sign Museum opened its doors to the public in Spring 2005 in a temporary home at the Essex Studios (Cincinnati). With the collection quickly outgrowing its rented space, the ASM unveiled its permanent home on June 23, 2012, in a former clothing factory in Camp Washington, just northwest of downtown Cincinnati. The renovated building features 19,000+ square feet of exhibit space (with another 20,000 waiting for development), 28-foot ceilings able to accommodate sizable outdoor signs, a working neon shop, flexible event space, and an extensive archive of books, photos and documents reflecting the art, craft and history of signmaking. For more information about the American Sign Museum, please visit americansignmuseum.org. The American Sign Museum is a 501(c)(3) not-for-profit corporation.